We’re going to start 2011 with a new blog feature: Fossil of the Week! My colleagues, of course, are welcome to also start “Mineral of the Week”, “Structural Geologic Feature of the Week”, or “Climate Event of the Week”. The more the better to keep our blog active through the winter! This week’s fossil was collected by Brian Bade of Sullivan, Ohio, and donated to Wooster as part of my hederelloid project. It is a beautiful specimen of the tabulate coral Aulopora encrusting a brachiopod valve from the Silica Shale (Middle Devonian — about 390 million years old) of northwestern Ohio. 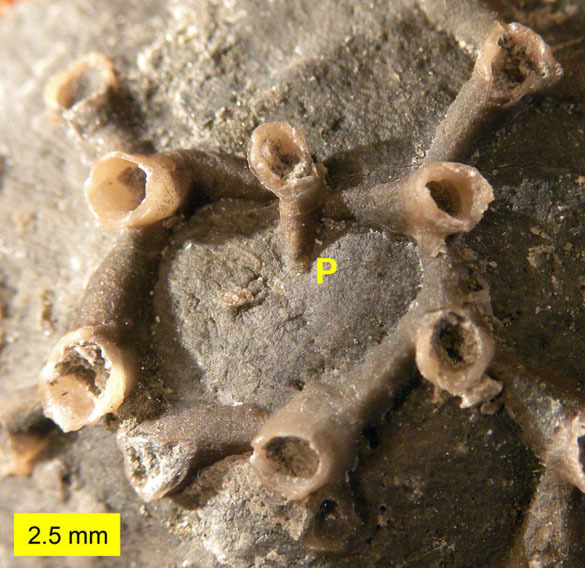 Auloporid corals are characterized by an encrusting habit, a bifurcating growth pattern, and horn-shaped corallites (individual skeletal containers for the polyps).